Pembara Madhu. Heṭṭiāracci, Ăntani Pīṭar. Koḷamba : Haṃsa prakāśakayō, 1975. From the University of Chicago Library. පෙම්වර මධු Pembara Madhu by ඇන්තනි පීටර හෙට්ටිආරච්චි Anthony Peter Hettiarachchi. 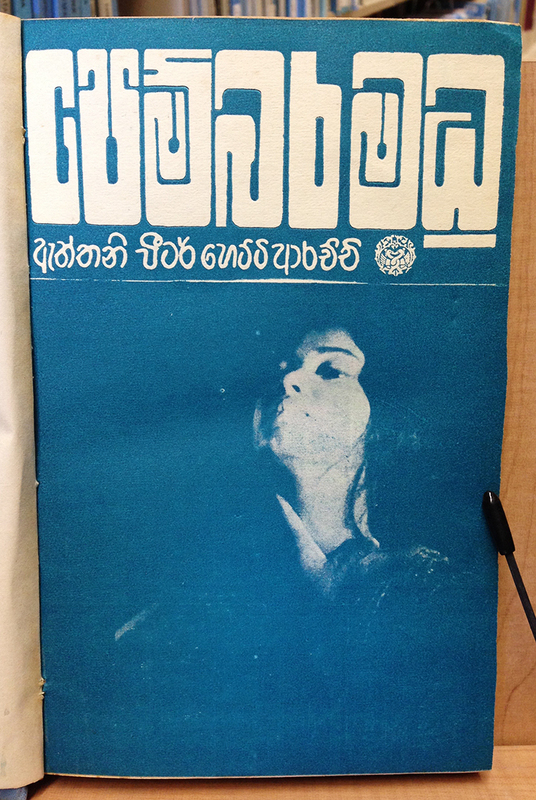 This Sinhala novel title apparently translates to “Romantic Honeymoon”. Not the type treatment I’d expect for that subject matter, which makes it all the more interesting. I think of all of the South Asian scripts, I’ve had the most difficulty deciphering different styles of Sinhala – its handwritten, underlying structure looks so much different than the typical text faces used in most reference materials. (I know I’ve mentioned this before) It took me much longer than it should have to transliterate this! Once I come up with a good graphic guide to compare typeforms with writing, I will share it here.